I'm very excited to be writing right now. I've had the urge all week to be productive and get my thoughts and .. experiences out. I'm sure you have already read the title so I might as well get on with it. For the past few years I've made a conscious effort to be more eco friendly. My goal is to live a zero waste lifestyle ( that will be a whole series coming up). Amongst researching eco friendly alternatives and ways to reduce my waste I came across the menstrual cup. I'll admit the first time I heard about this I was pretty freaked out. I also thought, well us girls spend A LOT of money on lady products from an unfriendly routine visitor. I'd say we spend around $120-$200 a year on this crap. Not to mention the impact on the environment caused by using these products. It's one of those things that we obviously can't really control, I mean we have to use them... no one wants to be a TMI WARNING - bloody mess. So I thought okay, I'll give it a go. How bad can it be right? I mean its eco friendly, better for my overall health, and it supposedly helps with cramps as well. I used a Diva Cup purchased from my local organic grocery store. I bought it for $50.00 as well as the plant based cleanser for about $12-$15. I thought it would be an investment. So, I try this thing out, first off it hurt/was very uncomfortable getting it in where it needed to be. Secondly, It's... a little messy. Here's where it gets tricky, the way a menstrual cup works is it suction's inside of you. It's pretty tricky to remove. You basically have to pinch the tip of the cup to release the section. The cup somehow moved it's way high up into my... you know.. "area". With a lot of reaching and slipping I finally managed to get it out. Rinsed it, and put it back in. I did this about 3 times. Each time was an even struggle to get out. I go to reach for the cup and found the cup had moved it's way even farther up this time where I could barley reach it! I was trying and trying to grab onto the cup with the little bit I could feel and it would not come out! It had a strong suction and was really far up. I'm thinking "OMG, I AM NOT GOING TO THE DOCTORS TODAY, I got a lady sushi date waiting for me! lol"
I tried and tried for about 10 minutes and after much panic I somehow managed to reach it and pull it out. I look at the cup and see it had little to nothing in the cup, it must of not fully opened up causing it to leak. After having basically a panic attack and going through so much stress about my diva cup getting stuck. I washed it and threw it right out. My overall experience was not very pleasant. I'll say it really wasn't worth the money and the stress I went through. I wish it worked well because the concept was really great and I've read online it works great for so many woman. I honestly will never re purchase the diva cup. 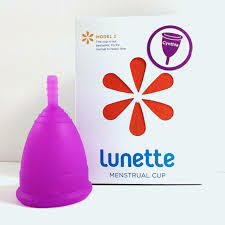 I'm curious about trying the Lunette cup because it seems to have a longer string to help grip the cup. Although. i'm not sure I'll spend the money to order it and risk it not working for me again. I hope this post made you laugh and cringe at the same time. Maybe you'll think about giving it a go or looking for other eco friendly options. If you do think of any please let me know!